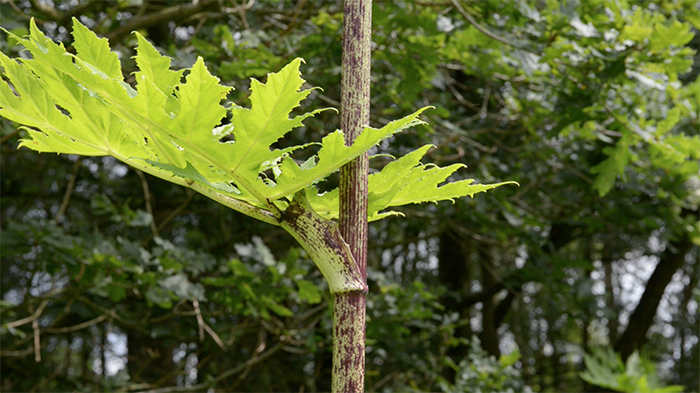 Giant Hogweed, Heracleum mantegazzianum, is in the news again as another child has been injured by coming into contact with the plant while playing outdoors. Giant Hogweed is an invasive species of plant from Central Asia, which was widely planted as an ornamental in the 19th century. It’s a member of the carrot family, or Apiaceae. As you can see from the following photograph, it grows to be a very large plant. Clearly, though, it can be encountered when it is still growing up and much smaller. Below is a video from Module 6 of my Tree and Plant Identification Masterclass. The course is for people interested in bushcraft and survival uses of trees and plants but also highlights poisonous species. It’s an in-depth paid course and the content is usually only available to course members. There is a need, however, to create greater public awareness of Giant Hogweed, Heracleum mantegazzianum, the injuries it can cause and how to identify the plant so it can be avoided. So, I thought I should release this video, which I made last year, in the hope that more people are aware of this increasingly common plant hazard. Please share this post so that as many people as possible are aware of Giant Hogweed. We’re seeing more and more of this plant in Vermont as well. Most people have never heard of it, and I know I thought a trek leader was pulling my leg when he pointed it out years ago. After all, I have been very active outdoors all my life and I’d never heard of it either. So I looked it up when I got home. The pictures of what it does to your skin are ugly, and I immediately recognized I had gotten it a year earlier, but assumed it was a bad poison ivy reaction. Nope, I treated it as normal and it only got worse and worse. I ended up with blood poisoning and needed antibiotics to finally clear it up. Not pretty. The pictures matched exactly what my leg looked like. Since the plant prefers the transition area from trees to open, exactly like near roadsides and ski runs, it is very happy here. I’ve even encountered trailheads so clogged with it, you couldn’t get to the sign in stand. I can say from experience, this is really bad stuff. I can see how it could become life threatening. I spread the word to anyone I can. I lead many trips to certain mountain top sites with patches along the trails, and I point it out every time. I’m sure some people think I’m pulling their legs, but hopefully it has saved someone along the way. Thanks for spreading the awareness. It is certainly needed in the U.S. too. I’m sorry to read that you had such a bad experience with this plant. BUT I’m also grateful to you for sharing your experiences. I’m hopeful it will serve as a salutary tale for others. You do right to point it out to all who will listen. I do the same with this plant and some of the other Apiaceae which have serious toxicity. You’re right though, some people look at you with some incredulity that these could be so seriously poisonous. Good video Paul. The carrot family certainly has some bad actors. In the states here we have another carrot cousin called Water Hemlock which is deadly poison if ingested. It’s good to know your plant neighbors. Good and bad. Good to hear from you my friend. We also have Cicuta virosa in the UK, although it is not particularly common. The common name here is Cowbane. We also have Oenanthe crocata, which has similar toxicity. Shared and pinned. Spooky thing is my Dad had terrible blisters like that one year on his legs in the 1980’s, hospital drew a blank, specialists didn’t have a clue. I can see now it,s incredibly likely that he’d come into contact with giant hogsweed along the canal where he walked the dog. It was very worrying. How does it affect animals in the wild given some of their underbellies are bare? Do they know how to avoid it, it’s not native? Thanks for releasing the video. Interestingly, I’ve seen deer push through it and not seem to care. Same with Hemlock Water Dropwort, which can have similar effects on humans. Thanks for your comment Carol. The study listed on a site Paul linked to below says livestock will definitely eat it. In fact, they say it’s an effective way to keep it under control! Sheep will go out of their way for it! No mention of dogs or cats though. Hi Paul, thank you for sharing this content from your course, it will help raise awareness of the plant but also of your online courses! I’m a beginning enthusiast in plants and trees, your course interests me greatly, please provide a link where I can learn more and see pricing. It’s great to hear you are keen on learning more about trees and plants, their identification as well as their uses. My course is a 12-module course, which starts in January and runs through the year, one module per month, with some “homework” to do in between modules. The course is currently closed for new enrollments as we are right in the middle of the 2015 course. I’ll be opening the course for enrollment at the back end of the year for new starters next year. The best way to keep up to date with details and timing of course enrollment is to get my email updates here (the form is in the sidebar) or to sign up for the newsletter over at Frontier Bushcraft (or both 🙂 ). I’ll send out an email update about how to enroll in the course later in the year. 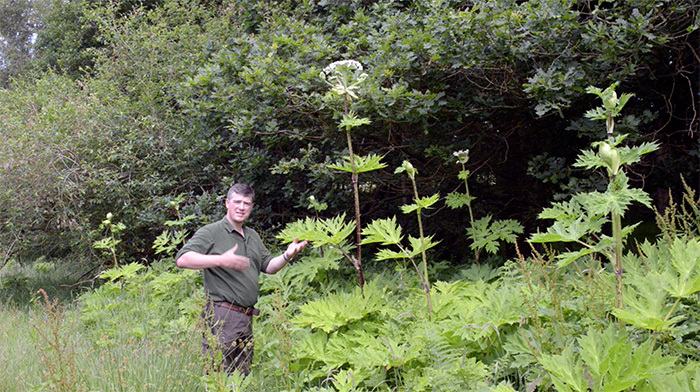 I had a close encounter with Giant Hogweed some years ago when on a field course with primary school children. It is a plant to be taken very seriously. Back then, we had to find a specimen to show the children what to avoid. I wish we had had your video then it would have made our task easier. Excellent post Paul. Many thanks. Having grown up in a foreign country I often have the misguided notion that the English countryside is pretty tame with only a few nasties (and very few wild animals) to be careful of. That said, I’d feel terrible if I passed that generalisation on to my young daughter and she suffered the severe effects of this plant! Great to hear from you. While we don’t have the snakes, spiders, scorpions, etc., or large animals present in some parts of the world, we do have our fair share of toxic plants, both native and introduced. It’s certainly worth being aware of them. Glad this was informative and hope all is well with you and the family. Saw this story Sunday and shared it in a few groups on facebook (A UK Veterans site and a Prepper site as well). It is a interesting and dangerous plant. Lets hope they get this under control with the weather we are having. Warm days and rain will make it ideal for it to grow here. Yes Will the furanocoumarins in Giant Hogweed and some other members of the Apiaceae family are responsible for the photodermititis which is presented in these cases. Thank you for this very informative and helpful video. I hope you continue doing so. You’re very welcome Bozidar. Glad you found the video helpful. As woodsman as I am I was unaware of this terrible plant. Your audience mention hogweed in the NE US. reminding us to protect children in the outdoors. As always it’s good to hear from you. My understanding is that the plant is in the NE and PNW, although how widely distributed and in what densities, I’m unclear. Thanks for highlighting the dangers of this plant again. I have shared on Facebook with a capital letter heading urging people to read this with the long school holidays upon us. I love your videos they are concise, to the point with no sidetracking. Keep up the good work and just as important keep having fun. Hi Paul thank you for posting another good and informative video, I was unlucky last month in that I came across giant hog weed when I was clearing a ditch, I was lucky that I only had my forearms exposed also that I was able to wash the affected area fairly quickly but I still had a few blisters on my forearms where the sap had touched my skin even after washing the area, my skin went dark brown in places with spots (looked a bit like chicken pox). I’m sorry to hear that. Are you now fully recovered? very good and informative video! I’m not sure if I faced that plant in the woods but from now on I’ll stay away from it. Also is very impressive as this plant can close a trail due its massive growing . Many thanks for sharing it. Glad you found it informative Pierluigi. Hi Paul, I think it would have been helpful if you identified the younger Hogweed plants hiding in the grass, if you were wearing shorts it’s these that might brush your skin before you know it. Although the brief glimpse of them in the video did show the leaves looked like the ones on the adult plant. Great information though, I haven’t seen any in my area, Dover Kent, but then I haven’t been looking for it. Thanks Colin. clearing my suburban garden in north east Kent at the weekend I got a burning feeling on my forearm but just brushed it off. Later noticed large, yellow ‘jellylike’ blisters on forearms and angry, red marks on hands and some on forehead. Believe it was giant hogweed. Have gone back and had a quick look for the plant but can’t find it – we will need to have a thorough search for this thing as we have young children. GP had never heard of it but proscribed steroid cream – fusidic cream/hydrocortisone. It’s the longer term impact that makes this a real pain. Good video by the way. Just done some more investigating online and reckon it was a fig tree that caused my burns, not giant hogweed. Some one has posted on another site that fig tree sap can react with strong sunshine and cause burns, phytophotodermitis. I have two fig trees so reckon these were the culprit as I was cutting these back. Not sure if the long term effects are as bad as giant hogweed though – hope not. Yes, Ficus species can cause a reaction. Hope the effects are not prolonged. That’s it more like this please. However the video didn`t work for me. kept stopping. The video is a fairly high bit-rate HD video, which will look good even on a large HD TV screen. So, it will need a decent connection speed to play smoothly at full resolution. You can toggle to standard definition by clicking on the “HD” letters bottom right. If you are using a small screen such as on a phone, you probably won’t notice the difference in quality but it’ll download more rapidly. By all the above, I would like to add a call to destroy these plants! This invasive species. The scale of this problem in my area poistene catastrophic, here there are whole fields! One child was killed taking the stalk in his mouth and a few blind children.